•	Considering Graduate School? Let Us Help •	10 Tips For Interview Success! PUBLISHER'S PAGE DEPARTMENTS Events and News................6 List of critical academic dates and immigration news. Café Bustelo is awarding $100,000 in college scholarships. Here's how you can get one. Financial Aid ...................... 8 Everything you need to know about goverment financial aid. How an FIU engineering student got an internship at the BEYA STEM Conference. Graduate Life....................22 Are you considering graduate school? We tell you why you should be. These are the pros and cons of attending a junior college. JobMatch experts give you career advice to get ready for your first day in the office. Hispanic, Latino, Latina, and Latinx researchers are pursuing STEM Ph.Ds. Advocates for the scientific community, they have published numerous manuscripts and peer-reviewed articles. As of 2018, Dr. Ruben K. Dagda received up to $4 million in funding from the National Institutes of Health (NIH) to perform neuroscience research and promote science, technology, engineering, and math (STEM) education. According to Yale, Richard G. Bribiescas was honored for his distinguished contributions in the evolution and endocrinology of human histories, and exemplary contributions to faculty diversity and development. Recently named fellow of the American Association for the Advancement of Science (AAAS), Bribiescas was also awarded the Medal of 600 Years Anniversary of the Restoration of the Krakow Academy for his research in human ecology. At Santa Clara University, where Rosemary Vergara majored in biology, minoring in public health and biotechnology, she joined the Blush Lab at Stanford University School of Medicine as a life science research professional. There, Vergara focuses on different research projects involving the interactions between HIV, influenza, and immune cells such as natural killer cells. 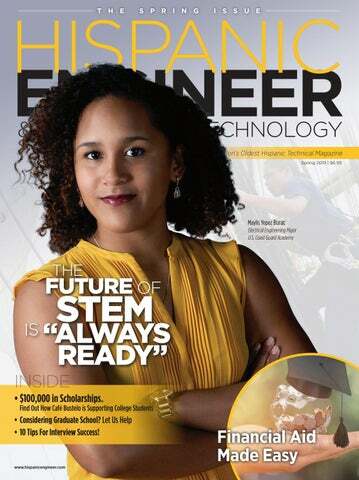 In this edition of Hispanic Engineer magazine, meet Latinas in STEM, staff scientists, and those who co-developed a technique to produce conductive materials for LEDs and smart windows. There’s also a feature with Dr. Evelyn Reátegui-Zirena, who won the Three Minute Thesis competition. She is an active member of the Society for Advancement of Chicanos/Hispanics and Native Americans in Science (SACNAS) and the Society of Environmental Toxicology and Chemistry (SETAC), where she is a mentor and a judge. She currently serves as the environmental toxicologist for the Utah Department of Health, assessing environmental risks related to human health. Gabriela Bosque Ortiz is pursuing a Ph.D. in neuroscience. She has been published in journals and is passionate about the advancement of people. She has acted by founding a SACNAS chapter and organizing outreach groups focused on sharing the stories of STEM students in research. Job Tools...........................29 Do you have an interview coming up? Here are 10 tips to help you nail it! Howard University professor talks about a gadget to help you learn computer programming. Hispanic Engineer & Information Technology, (ISSN 10883452) is a publication devoted to science and technology, and to promoting opportunities in STEM fields for Hispanic Americans. This publication is bulk mailed to universities and colleges nationwide and in Puerto Rico. The editors invite editorial submissions directed toward the goals of Hispanic Engineer & Information Technology. In particular, HE&IT magazine wishes to present ideas, current events, and personality profiles of successful Hispanic Americans in science, technology, and related business pursuits. Fully developed articles may be sent, but queries are strongly encouraged. Articles and letters should be sent to: Hispanic Engineer & Information Technology, Editorial Department, 729 E. Pratt Street, Suite 504, Baltimore, MD 21202. No manuscript will be returned unless accompanied by a stamped, self-addressed envelope. Hispanic Engineer & Information Technology cannot be responsible for unsolicited material. Copyright ©2019 by Career Communications Group, Inc. All rights reserved. Printed in the U.S.A. The HSF Scholarship is designed to assist students of Hispanic heritage in obtaining a university degree. Scholarships are available, on a competitive basis, to High school seniors, Undergraduate students (all years), Community college students transferring to four-year universities, and Graduate Students. Awards are based on merit, and amounts range from $500 to $5,000, based on relative need, among the Scholars selected. Their partners provide HACU scholarship opportunities. All college students must have completed their first semester of freshman year at the time of applying. The Dream.Us scholarships are for highly motivated DREAMers who want nothing more than to get a college education but are unable to afford the cost. They have no access to federal aid, limited access to state aid, and they sometimes face paying out-of-state tuition. The National Scholarship is for high school or community college graduates. The Opportunity Scholarship is for students who live in targeted, locked-out states where they cannot get in-state tuition. Your eligibility for both is based upon where you live. The GMAT exam is available only at designated Pearson VUE test centers. Visit www.MBA.com Choose a Test Center to search for a test center near you. (https://registration. mba.com/testtaker/registration/SelectTestCenterProximity/ GMAC?conversationId=1627908) Create an account on mba.com for all the resources you need for your graduate business degree journey . conic espresso-style coffee brand Café Bustelo has launched the Café Bustelo El Café del Futuro Scholarship in partnership with the Hispanic Association of Colleges and Universities (HACU). Since 2014, $230,000 in college funds have been awarded to 46 Latino students nationwide through the partnership. The campaign generated more than 1,500 entries in 2018. In 2019, Café Bustelo is doubling the total available scholarship funds by awarding $100,000 to 20 students. Café Bustelo is encouraging Hispanic students to submit an essay in English or Spanish (800 words or less) describing how their heritage, family, and community have impacted their desire and motivation to obtain a college degree; how they plan to give back to their community; and what they intend to accomplish with their degree. Eligible U.S. students can apply for the opportunity to receive one of 20 $5,000 scholarships by submitting their essay. All eligible applications must be received by May 24 at 11:59 p.m. CT, and scholarship recipients will be announced on or around Sept. 16. "For 90 years, it's been the mission of Café Bustelo to support and reinvest in the Latinx community," said Eduardo Merino, senior brand manager at Café Bustelo. "Giving back is part of our heritage and DNA." For this year's scholarship, Café Bustelo combined its history of supporting the arts with its proud heritage of reinvesting in the Latino community. The brand collaborated with four artists to design limited edition art tins as part of its Artist Series, with a percentage of sales going toward the scholarship. The art tins are now available for purchase at grocery retailers nationwide, while supplies last. "It is our passion to give rising artists a platform to share their work all while helping young Latinxs achieve their sueños (dreams) through the Café Bustelo El Café del Futuro Scholarship," Merino said. Henry Hap Arnold education grant applications for the 20192020 academic year The General Henry Hap Arnold education grants are awarded based on financial need. Each year, named grants are made to students in honor of individuals or organizations that have exemplified extraordinary service to the U.S. Air Force. A select group of incoming college and university freshmen who complete the Gen. Henry Hap Arnold education grant application with a 4.0 GPA are invited to apply for the Air Force Aid Society merit-based, achievement scholarships. Applications are evaluated based on cumulative GPA scores, high school transcripts and written essays. Henry Hap Arnold education grant applications for the 2019-2020 academic year will be available January 2019. A total of 2,556 students received the education grants and merit-based scholarships, ranging from $500 to $5,000, during the 20182019 academic year. HE For complete information and scholarship guidelines, please scan below. Café Bustelo coffee is available at leading grocery retailers nationwide and online at JavaCabana.com. Visit CafeBustelo. com for more information. financial aid office and depends on the student’s financial need and the availability of funds at the college. Teacher Education Assistance for College and Higher Education (TEACH) Grants are awarded to students who intend to teach in a public or private elementary or secondary school that serves students from low-income families. If the service requirement is not fulfilled, it could turn into a loan. Iraq and Afghanistan Service Grants are awarded to students whose parents or guardians were members of the armed forces and died as a result of performing military service in Iraq or Afghanistan after Sept. 11, 2001. To qualify, a student must have been under 24 years of age or enrolled in college at the time of the parent’s or guardian’s death. The Federal Perkins Loan Program is a campus-based program that provides lowinterest loans to undergraduate and graduate students. The amount of the award depends on the student’s financial need, the amount of other aid the student receives, and the availability of funds at his/her college. Check state and local government websites regularly for scholarship award announcements. Community organizations also award scholarships based on academic ability or other factors. Loan might be subsidized or unsubsidized. Direct PLUS Loans are always unsubsidized. Subsidized loans are based on financial need and are available only to undergraduate students. The federal government pays the interest on subsidized loans while the borrower is in college and during deferment. Unsubsidized loans are based on the student's education costs and other aid received. The borrower must pay all accrued interest on unsubsidized loans. State government aid: For more information, contact the state’s higher education agency. You can find the state agency’s contact information at https:// wdcrobcolp01.ed.gov/Programs/ EROD/criteria.cfm. Aid from the college: Students should contact the financial aid offices at the colleges they are considering for more information. organizations, private employers, and other organizations award scholarships based on academic ability or other factors. For more information, visit https:// StudentAid.ed.gov. Tax credits for education expenses: For more information about the American Opportunity Tax Credit and Lifetime Learning Tax Credit, visit https://studentaid. ed.gov/types/tax-benefits. •	The United States Military Academy was founded in 1802 and is located in West Point, NY. •	The United States Naval Academy was founded in 1845 and is located in Annapolis, MD. •	The United States Coast Guard Academy was founded in 1876 and is located in New London, CT. •	The United States Merchant Marine Academy was founded in 1943 and is located in Kings Point, NY. •	The United States Air Force Academy was founded in 1954 and is located in Colorado Springs, CO.
Young Hispanics in science and technology continue to make their mark on the world. We are featuring a snapshot of individuals who have achieved excellence in their field. All of the people showcased are competing on the global level in cutting-edge fields that are revolutionizing the world. Beyond their own professional goals, they are also dedicating time and energy to developing pathways for others to follow. Their impact is being felt far and wide as they build the basis of a better tomorrow in both the field of science and their communities. Dr. Diana Azurdia is the associate director for recruitment for graduate programs in bioscience at UCLA. She leads development to enhance diversity in the biomedical graduate student population. She was recently awarded a Howard Hughes Medical Institute Science Education Fellowship. Additionally, Dr. Azurdia uses her platform as a National Research Mentoring Network master facilitator to promote inclusive mentoring practices at UCLA. Dr. Azurdia also serves on the board of directors for SACNAS. She is a first-generation Guatemalan-American and the first in her family to attend college. biological chemist. She then worked in Pharmacology at her alma mater. In 2007, Benavides completed her masterâ&#x20AC;&#x2122;s degree at the University of Texas-Pan American. As a doctoral candidate in the University of Texas at San Antonio, she is working with protein scaffolds with potential applications in alternative energy and medicine. As a scholar, she is strengthening skills in teaching and performance. Additionally, she is an active member of SACNAS. and has been a part of the SACNAS mission since 2009. Last year she was selected for the Linton-Poodry SACNAS Leadership Institute 2017 cohort. She continues to mentor students and has led workshops that encourage younger students to pursue careers in the STEM fields. (Society for Advancement of Chicanos/Hispanics & Native Americans in Science) is the largest multicultural and multidisciplinary STEM diversity organization in the country. Broadly inclusive, SACNAS has developed a suite of events and programs that invest in the next generation of diverse STEM talent. Participation (LSAMP) Program and Chemistry Honor Society advisor. More recently, she was named interim chair of the Physical Science Department at UTPB. Raytheon fosters an inclusive culture that harnesses the power of different ideas and experiences to deliver the innovative solutions our customers depend on. Â© 2019 Raytheon Company. All rights reserved. after an eventful BEYA Conference in Washington, D.C., Cadet Maylis Yepez Burac said the chance of networking at the annual conference which celebrates science, technology, engineering, and math (STEM) was enlightening. “My favorite highlight was the Stars & Stripes Dinner, where we met senior personnel of the Coast Guard,” Burac said. 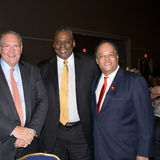 “Their insights on the military and STEM careers were invaluable, and I’m grateful to have had the opportunity to learn from them.” The Stars & Stripes Dinner at the BEYA STEM Conference is one of the nation’s largest events honoring active and retired African-American admirals, generals, and members of the federal Senior Executive Service. Each year the featured service of the Stars & Stripes event alternates between the Air Force, Army, Navy, Marine Corps, and the Coast Guard and is determined on a rotating basis. The U.S. Coast Guard was the featured service of the 2019 Stars & Stripes event, which left Burac in awe. confidentiality and free me from being a mandated reporter during sessions,” she says. Burac also recently passed her emergency medical technician national certification assessments. When she’s not working, she enjoys musicals, cheerleading, and the campus concert band. A Cutter man in the making Burac hopes to become a cutterman, an elite Coast Guard badge of honor that requires years of sea time and commitment. HOW AN FIU ENGINEERING STUDENT LANDED AN INTERNSHIP AT NORTHROP GRUMMAN Florida International University is a public research institution in Miami. It has awarded more than 330,000 degrees since 1972 and enrolled more than 57,000 students. Its College of Engineering and Computing is the nation’s largest producer of Hispanic engineers. experience, and I was fortunate enough to interview with Northrop Grumman, and they offered me a position right then.” As an electrical engineering intern, Rubio said he supported a United States land-based missile in service with the Air Force. “My main task was to develop a software tool that would automatically check a digital parts list for errors and calculate the accuracy… The desktop application I built allowed the developers of the parts list to frequently check the accuracy of their work before the software goes into a weapons system.” Rubio’s senior design capstone project happened to be designing an app that found errors in a data list. The experience he gained taking software technique classes at FIU, working on a robotics competition, and as a research assistant was invaluable for his summer internship. Rubio said recruiters at the BEYA STEM Conference and Career Fair look at your GPA, applicable classes you have taken, projects you’ve worked on, relevant jobs and military service, clubs you belong to, and how you add value to your community. The coolest thing about his internship was delivering the final product and hearing all the feedback at Northrop Grumman Corporation (NGC). “Just being in Utah was cool, too… I also really liked the work environment. They expected a lot out of you at NGC, but everyone is nice and willing to help. They have a lot of barbecues and team building functions. We had at least one barbecue or potluck a week,” he said. The BEYA STEM Conference has built strong, lasting partnerships with many of the top companies and government agencies in America. WHY YOU SHOULD GO TO GRAD SCHOOL In a recent report, Excelencia in Education (Excelencia) and the Hispanic Association of Colleges and Universities (HACU) said the 2015-16 academic year saw growth in the number of Latinos attending college. As a result, there is an increase in the number of Hispanic-Serving Institutions (HSIs) in the United States. In 2015-16, 14 percent of all institutions of higher education (472 HSIs) enrolled 64 percent of all Latino undergraduates. In general, HSIs have 25 percent or higher Latino enrollment. The number of Latinos earning credentials in STEM increased, but Latinos still earned a small percentage of credentials conferred in STEM. Latino degree attainment in STEM is concentrated at the baccalaureate level. “The report shines a light on what many of us know to be true: that diversification within STEM postsecondary education, particularly among Hispanics/Latinos over the last decade, has been largely in the area of certificate/associate levels and diminishes at each successive level,” said Dr. Gabriel Montaño, research scientist at the Los Alamos National Laboratory and president of the Society for Chicanos and Native Americans in Science (SACNAS). “The result is an increasing discrepancy in positions of leadership within the STEM workforce. The awarding of master’s and doctoral degrees through private and research-intensive institutions suggests a potential socioeconomic pattern that would be of significant interest to investigate further,” he said. The top institutions awarding graduate degrees to Latinos in STEM are: Master’s Degrees Awarded to Latinos in STEM Fields 1. 2. 3. 4. 5. Mexico Highlands University, NM “As the nation’s demographics continue to shift and as STEM skills and mindset continue to be embraced by employers, it is critical that state and federal policies be developed that can support Latino-focused STEM programs that will provide our workforce the diversity it deserves,” said Andrés Henríquez, Excelencia in Education board member and former program officer with the National Science Foundation and the Carnegie Corporation of New York. In particular, the report highlighted El Paso Community College in Texas and the Georgia Institute of Technology. A partnership between El Paso Community College (EPCC) and the University of Texas at El Paso (UTEP) ensures that academic preparation leads to seamless transfer to its four-year computer science program. THE PROS AND CONS OF COMMUNITY COLLEGES Community college is not what it used to be. There are major incentives for attending a local junior college. Not to mention the obvious financial advantage, junior college is a place where you can knock out your general courses and explore your other interests on a schedule that works for you. n my own experience, I found that junior college was a great place for me to figure out what major I was going to pursue and where I would eventually obtain my degree from. Pros Cost of Tuition The most obvious reason that students attend community college is for financial advantage. Many junior colleges cost less than $2,000 per semester to attend full-time. Attending community college gives students the chance to prepare for the financial demands of a four-year university if they plan on transferring. Flexible Schedule Many students don't realize that if they plan on working while attending school, community college is hands down the best option. They offer far more night classes than other universities and more schedule options. The workload, unfortunately, is lighter than a state school or private university, and attendance is not usually required. Give Students an Opportunity to Explore Major Options Instead of spending thousands of dollars at a private university towards a major that you are not sure of, consider attending a community school while you are making your decision. well-seasoned academics who carry an impressive resume. Community schools are just as flexible for the students as for the professors. Transitional Attending community school gives students the opportunity to earn college credit while taking their time in selecting the four-year institution that is right for them. Because there is little financial investment, most students are deterred from dropping their studies altogether. What you need to know for your first day at a new job Last year, Career Communications Group’s Student Success column brought you networking rules for professional life. This year’s edition will include “Principles of Networking” to reinforce some of those fundamental rules that help you connect with like-minded people. areer Communications Group’s Student Success column is excited to welcome back Job Readiness expert Courtney Taborn. In this series, she will focus on resume writing skills and interpersonal skills (aka networking). Learn how to present yourself in the best possible way to ensure success. Is your resume 2019-Ready? Are you presenting your best self? Need resume tips? What are your 2019 goals? “The day for your new job starts the night before,” notes Courtney. In this edition of her career tips and advice, she tells you how to prepare for an anxiety-free first day on the job with a little help from Kendrick Lamar. 1. Attend to physical needs—pack lunch, sleep well, arrive early If you’re familiar with Maslow’s hierarchy of needs, it should come as no surprise that attending to your physiological needs is the most important thing you can do for your first day of work. Here’s a quick rundown of them. First, your clothing choice. For those of you who don’t know, we in the United States have a pretty serious love affair going on with our air conditioning. If you are beginning your new job on the hottest day of the year, you need to plan and bring a sweater. Next, be sure to wear clothes and shoes that you are comfortable in. At most offices, the first day includes a walking tour, onboarding tutorials, and paperwork, which means a lot of sitting and a lot of standing. 3. Prepare to talk Okay, I know this sounds like the exact opposite of my last point, but stick with me. During your first days and weeks at a new job, you are going to be introducing yourself to your coworkers, some of whom might be your superiors. If you tend to be an over-thinking, anxiety-prone individual like myself, you know how a poorly timed joke can wreck your sleep for a week. But I have some good news! Practicing your “elevator speech” can help you avoid the soul-sucking rumination that leaves you feeling as though you’ve made a fool of yourself. U.S. citizenship is required. NSA is an Equal Opportunity Employer. etting out alone for a 10-hour drive to Texas—with no interview scheduled—Tamara left her home in New Albany, MS, with the goal of working for Lockheed Martin. Fresh out of college with a bachelor’s degree in mechanical engineering, she headed to Texas in 2002 to join the company at the crest of military aviation technology. “I moved with no family, less than $300 in my pocket, and I had never driven more than three hours alone,” she says. “My purpose was to land an engineering position with Lockheed Martin in Fort Worth, TX.” Did she have an interview scheduled? No. Had Lockheed Martin given her an invitation to visit? No. Did she know where she would stay? Not exactly. Was she sure she could get a job? To that question, she paused, and then returned another: “Why not?” Interviews are just conversations, but you’ve got to prepare for them. Here are a few tips to help you prepare. learn about what they do and about the job. Familiarize yourself with their mission statement. Be familiar with the job you are applying for and be prepared with reasons why your experiences make you the best candidate for the job. Be prepared with three to four follow-up questions about the company or job. •	Clean up your social media sites. Employers may look beyond your work references to determine whether you are a good fit for their company. Now is a good time to go through your public information and make sure it won’t raise any red flags. •	Rehearsing your answers to typical interview questions will help make you feel comfortable during the interview. Be prepared with your professional goals and how the job for which you are interviewing fits into those goals. know the company dress code, assume professional dress. A conservative hairstyle, makeup, and jewelry are encouraged for interviews. For more tips on appropriate dress, see the Corporate Code section. your interview time. Research the route so that you will have an estimation of how long it may take for you to arrive. Do you know where to park? What building or floor is your interview on? What is the name and contact information of the person interviewing you? Having this knowledge will ensure that you make a good impression by arriving on time and ready for your interview! handshake. These nonverbal cues can have a big impact on your first impression. experiences listed on your resume to support why you are the best candidate for the job. If you do not have prior work experience, pull experiences from school, volunteering, clubs, and any other opportunities you are involved with. think about the questions you are being asked. Feel free to seek clarification on a question. Make sure you are paying attention and listening to the entire question before you answer. •	Be prepared and bring a few copies of your resume and references with you. Bring a pen and notepad for taking notes. •	Send a follow-up thank you note. LEARN COMPUTERS WITH PI Eben Upton, the founder of Raspberry Pi, has made a habit of doing the impossible and making it affordable. The first Pis were launched in the spring of 2012 after Upton and a group of teachers, academics, and computer enthusiasts devised a computer to educate and excite children. The original Pi offered two versions at $25 and $35. Project repository. Android Marshmallow (codenamed Android M during development) is the sixth major version of the Android operating system on the Raspberry Pi devices scheduled for release sometime in 2018. The Raspberry Pi has been the catalyst of the imagination of the public. Computing has not seen such good days in about 10 years. The Internet is full of all types of fun and important applications. The following is just a list of my 10 favorite applications: 1. 2. Pi Hacker 3. Raspberry Pi Weather Station 4. 10-inch Raspberry Pi Touchscreen 5. Home Automation 6. Raspberry Pi Super Computer Cluster 7. Survey Results! Where are the best jobs in the defense industry? Which occupations can you check on the major defense career list? Do you know the top jobs that recruiters are looking to fill? To get answers to these questions, read Career Outlook’s tips on preparing for defense jobs. Defense INTELLIGENCE The defense industry is at a crossroads and is expected to experience some major shifts in the upcoming years. If you are a current or future college graduate looking to join the defense industry, having an awareness of these trends will put you at an advantage when seeking employment. From shifts in research and development strategies in the global defense industry to the varying degrees of digitalization in defense processes, changing dynamics may dictate some new approaches to entering the workforce. It is prudent for college students and recent college grads to gain an awareness of these trends in order to maximize their marketability to a potential defense industry employer. recruiter@aarcorp.com http://www.aarcorp.com/careers/ AAR is a leader in providing aviation technology and services to both commercial and defense customers. The company manufactures control systems, containers, transport pallets, and shelters. It also offers supply chain management services, aircraft maintenance, and repair. The company’s roots are in building aircraft radios. https://www.accenture.com/us-en/careers Accenture is the largest consulting company in the world. The consulting services range from technology to project outsourcing to Fortune Global 500 companies and governments around the world. The company has active operations in many countries. Many organizations look to Accenture when trying to boost revenue, discover new markets, and find operational improvements. to Mercedes Benz Stadium and the Hyderabad Metro Rail in India. The company is active in pursuing and completing large-scale projects. Aerojet Rocketdyne’s business is rocket science. The company is the biggest manufacturing company for space propulsion systems. Its systems are used almost exclusively by the U.S. government and defense contractions. NASA, Raytheon, Lockheed Martin, and the Pentagon can all be counted as ongoing customers. https://www.battelle.org/careers The Battelle Memorial Institute is a nonprofit dedicated to research. It is actually one of the world’s largest research organizations. Research is conducted with the help of 22,000 scientists, engineers, and support staff. The areas of research include energy, defense, and health. The organization has facilities scattered across the U.S., including Oak Ridge National Laboratory and Idaho National Laboratory. consumer goods packaging. Companies such as Coca-Cola and Unilever are big customers for this packaging. The company also generates about 10 percent of its net sales from an aerospace business, providing things such as sensors and instruments primarily to the U.S. government. http://www.bellflight.com/careers Bell Helicopter, a Textron Inc. company, manufactures a variety of aerial vehicles, including unmanned vertical lift aircraft, helicopters, and, with partner Boeing, the V-22 Osprey. It also provides repair services, maintenance, and training. The company has maintained a leading position in the vertical lift sector of aviation. It maintains operations globally, but primarily focuses on the European, Asian, and North American markets. Boeing is the largest aerospace company in the world. The company’s aircraft can be seen at any airport in the world. The company serves multiple sectors, including commercial, military, space, sea, and science. Beyond manufacturing, the company has large operations in financial and leasing services. Cubic Corporation provides a number of tailored solutions to clients globally. The company focuses on areas such as communications, intelligence, surveillance, mission solutions, and information technology. The company also creates solutions for the integration of payment options with transportation. The company deals primarily with governments. https://www.boozallen.com/careers.html Booz Allen Hamilton is a leading global consultancy. The company’s primary business is helping the U.S. government operate in the best way possible. The company operates globally as it helps fulfill this goal. Areas of expertise include project management, training, strategy, systems engineering, and cybersecurity. https://www.curtisswright.com/careers/ Curtiss-Wright is a global industrial company with many different lines of business. Some of them include supplier to the Pentagon, commercial aerospace, upgrading of power plants, and general industrial technologies. The company operates in over 200 locations worldwide with a strong focus on emerging markets. The company has recently agreed to be acquired by SAIC. government embassies. The company routinely operates in areas as diverse as construction, engineering, staffing, and munitions manufacturing. DynCorp International is in the business of providing maintenance, service, and support in the aviation industry. The company’s logistics solutions provide a full suite of services to keep the military flying forward. DynCorp International services clients both in the U.S. and internationally. http://www.engility.com/careers Engility offers a wide array of services to the federal government. Many of the services can be classified as support services, such as engineering, software development, project management, staffing, logistics, and a number of others. The company is the result of a spinoff of government services businesses that were owned by L-3 Communications. https://www.fluor.com/careers Fluor is focused on the project management of some large engineering and construction projects. Services provided include design, procurement, construction, and maintenance. The projects constructed include hospitals, power plants, and refineries. Half of its projects are in the areas of energy, chemicals, and mining. https://jobs.gecareers.com/ GE Aviation is one of the largest producers of jet engines in the world. In addition, the company actively operates in providing servicing solutions for both commercial and military aircraft. This global company has operations in many countries. It is also a subsidiary of the conglomerate General Electric (GE). General Dynamics is a major contractor for the Pentagon. The company produces a diverse range of products, including warships, submarines, tanks, and munitions. The company also engages in information technology fields and aerospace designs via Gulfstream Aerospace and Jet Aviation. Harris Corporation is a leader in communications for both commercial and government customers. The company’s solutions can be found on battlefields and in satellite communications, wireless transmissions, air control systems, and radio frequency. While the majority of its revenue comes from the government, the company maintains a substantial list of customers in fields ranging from energy to maritime. ships, oil hull tankers, and surface ships. Most of the company’s products are sold to the U.S. government. https://www.honeywell.com/careers Honeywell International is a large conglomerate that makes everything from jet engines to thermostats. This century-old company operates in aerospace, construction technology, materials, and industrial solutions. The company has operations globally with an increasing number of new technologies and solutions. https://www.ibm.com/employment/ IBM is a storied company as one of the pioneers of the computer industry. The company is staying at the forefront of development with an increasing focus on cloud computing, blockchain, and cybersecurity. The company continues to maintain a footprint in all areas of computing and technology. It has been one of the leaders for patents granted. careers@kbr.com https://www.kbr.com/careers KBR is a company that builds big things. The company was formerly part of Halliburton. Many of the world’s leading hydrocarbon production facilities were built by KBR, and the company provides many additional services to the U.S. government in a variety of fields beyond construction. Half of the company’s revenue comes outside of the U.S.
L3 Technologies is a defense contractor that focuses on delivering intelligence, reconnaissance, and surveillance solutions. The company is a leader in night vision equipment, aircraft maintenance, and training services. The majority of its revenue stems from the United States, but opportunities for employment are available globally. customers are in the intelligence, homeland security, defense, health care, and civilian marketplaces. Since a 2016 merger, the company has grown in its focus on information and intelligence services. The company’s revenue is mainly from the U.S. government. https://www.lockheedmartinjobs.com Lockheed Martin is a leading government contractor. The Department of Defense accounts for 60 percent of its total revenue. The company is known for its manufacture of satellites, aerospace vehicles, missiles, and nautical technologies. The company has a long history and can trace its origins back to 1912. ManTech International’s main business is providing information technology security services primarily to U.S. government agencies. Some of its business offers include communications, digital forensics, intelligence, and security systems development. The company works closely with the government. It maintains offices in approximately 40 nations. https://www.mitre.org/careers/working-at-mitre The Mitre Corporation is a not-for-profit organization dedicated to providing consulting, engineering, and research service for U.S. government agencies. Several researchers from MIT formed the organization, which has now grown to employ over 7,000 specialists in various fields. Most of the jobs are located in either Virginia or Massachusetts. https://www.moog.com/careers.html Moog Inc. manufactures high-quality components for usage in a number of industries. The company’s components are used extensively in commercial and military aircraft flight control systems. The company also provides engineering products for sectors such as space, medical devices, and defense. The company is named after its founder, Bill Moog. http://www.northropgrumman.com/Careers Northrop Grumman is the world’s fourth largest military contractor. The company’s products and services touch every aspect of the modern armed forces. Leading research is part of the company’s focus on technologies like spacecraft, laser systems, and technology systems. The company’s origins go back all the way to 1927.
https://oshkoshdefense.com/careers/ Oshkosh Defense manufactures vehicles for militaries and security forces worldwide. The company has delivered over 150,000 vehicles since its founding 100 years ago. Its customers come from over 20 countries. The company provides computer integration services to network vehicles for better command and control. https://www.pae.com/career PAE offers a number of services, including engineering, maintenance of military vehicles, information technology, logistics, and base support services. The company mostly serves the U.S. government, allies, and many international organizations. The company operates in more than 60 countries with around 20,000 employees. The company’s focus is deeply integrated into the U.S. government. https://perspecta.com/careers Perspecta is the result of the combination of three public sector companies: DXC Technology, Vencore Holding Corporation, and Keypoint Government Solutions. The company’s core skills are in solving big problems that the government faces. The projects for the company are diverse and vary based on the current needs of its clients. of sea, space, cyber, land, and air. The company is active in the civilian marketplace and offers technologies related to electronic products, electronic services, and food safety technology. and Beechcraft aircraft as well as the Bell helicopters used by its military and commercial clients. It also manufactures golf carts, ATVs, and products as diverse as power tools and marine systems. Rockwell Collins’s core business is the manufacture of communication equipment and electronics for both civilian and military aircraft. In addition, the company offers services in flight training, navigation, and surveillance systems. Rockwell Collins has agreed to be acquired by United Technologies. United Technologies is an industrialfocused company. Segments of the company, such as Otis, UTC Climate Controls & Security, and Pratt & Whitney, are engaged in a variety of businesses that include aerospace, construction, and security. The company is probably most famous for Otis, the world’s largest elevator and escalator company in the world. https://jobs.saic.com/ SAIC provides support for government clients with the management of supply chain, logistics, and technology support. The company is continuously evolving how to integrate technology and engineering to make things smoother for its clients. Over half of its employees are deployed directly to the customer sites. https://www.samsung.com/us/careers/ Samsung is a company known for its phones, televisions, cameras, and semiconductors. It is a South Korean company with a global presence. The company manufactures many things beyond electronics and operates in a variety of industries. The company places a heavy emphasis on research and development. Telephonics makes communication equipment for both commercial and military markets. The company focuses on developing communication equipment that works in places such as helicopters and ships. It also manufactures radar and audio equipment as well as wireless systems. The majority of its products and services are purchased by the U.S. government. https://vectrus.com/careers Vectrus is a company focused on logistics, information technology, and network communication services that was founded in 1945. It has a strong commitment to hiring veterans, who make up over a third of the workforce. The company operates in 18 countries and is unique as it has more subcontractors than employees. AD About 12% of the U.S. population is African American, yet just over 5% of engineering professionals are African American. How will you achieve diversity in this critical profession? of hiring managers would hire college interns for full-time, permanent positions. â&#x20AC;&#x153;Some of our Outstanding Scholarsâ&#x20AC;? YOUR FUTURE IS BUILT HERE Join a diverse team that is united in pushing the boundaries of imagination and excellence. Come shape the future with us. boeing.com/careers Boeing is an Equal Opportunity Employer. Employment decisions are made without regard to race, color, religion, national origin, gender, sexual orientation, gender identity, age, physical or mental disability, genetic factors, military/veteran status or other characteristics protected by law.